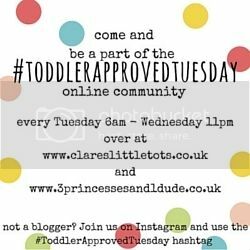 It’s Tuesday again which means the #ToddlerApprovedTuesday link up is open and ready for all your toddler fun posts and photos! Over the last few weeks my younger Little Tots have been having a lot of fun with this simple baby play idea – a pom pom drop. It’s kept them engaged for so long! My co-host Becky and her Monsters from 3 Princesses and 1 Dude! have enjoyed this fun Alphabet Soup learning activity which offers such a fun way to learn through playing as well as lots of imitative play. My favourite post from last week is this Puffy Paint from Chocolate and Wine and I’ll be fine – the colours are so beautiful we love making puffy paint!